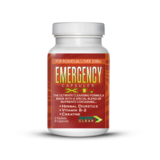 Emergency Detox Capsules XL Drug toxins are stored in the fat cells and remain there until the fat cells are burned for energy. When the fat cells burn, the toxins gets released back into the bloodstream to be filtered by the kidneys and deposited in the bladder to be released in the urine. Rapid Clear Emergency XL Capsules is an undetectable product and is effective in within 45 minutes of being taken for users over 200 pounds. Rapid Clear Emergency XL Capsules works by holding in toxins so your can give a toxin free urine sampleRapid Clear Emergency XL Capsules are laboratory tested and proven to be effective for up to 5 hours after taking the Rapid Clear pills. Rapid Clear Emergency XL Capsules will not lower your urine’s pH level, creatine level, and effect the specific gravity of your urine and remains undetectable. For best results, users of Rapid Clear Emergency Capsules XL should urinate frequently inin the morning and avoid high sugar drinks or food and you should not do any form of exerciset.